trendiing® en la revista Marie Claire! 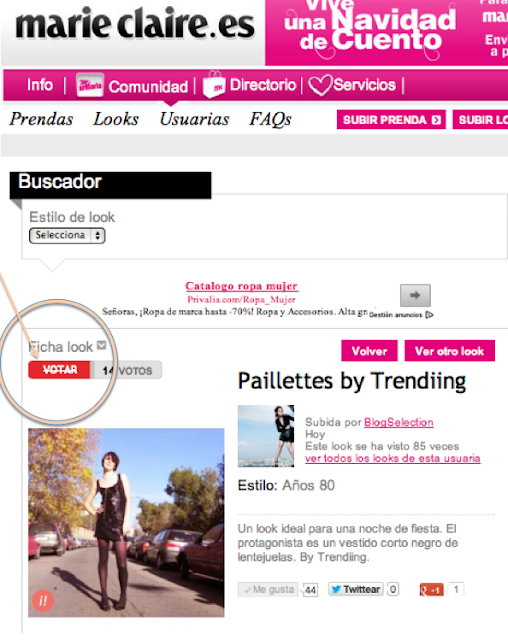 – trendiing® at Marie Claire fashion magazine!!! La revista de moda Marie Claire, en su formato digital, ha seleccionado nuestro último estilismo y competimos como mejor look!!! Por favor, votadnos! Es muy fácil. Sólo hay que pinchar en el link adjunto y dar click en “votar”. Gracias! The fashion magazine, Marie Claire, has selected for its online edition, trendiing´s last outfit, to compete as best look! Please vote for us! It´s very easy. You have just to click on the link below and click “VOTAR” (to vote). Thank you very much!